Viewing 9 of 9 items. Let's Celebrate! These invitations feature champagne flutes die-cut cards attached to printed invitations on white cards secured with gold cord. Invitations, envelopes, diecuts and pre-cut gold.. Announce your party in style with this festive invitation. Turn the card over to see the pattern on the back which adds a special accent to the invitation. Blank white envelopes are included. Card..
Black and navy cityscape is the perfect invitation for any city party. Blank envelopes are included. Invitation size is 5.5" x 8.5". Flat printed in your choice of ink color and typestyle. Printed.. Cheers! These invitations feature champagne bucket die-cut cards attached to printed invitations on white cards secured with gold cord. Invitations, envelopes, diecuts and pre-cut gold cord are sold.. Celebrate the New Year with friends and family with these festive invitations. This set of invitations are flat printed in your choice of typestyles. Blank envelopes are included. Invitation is.. Cheers! 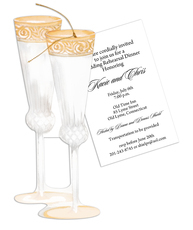 These invitations feature champagne flutes die-cut cards attached to printed invitations on white cards secured with gold cord. Invitations, envelopes, diecuts and pre-cut gold cord are sold.. Celebrate the Holiday Season with friends by sending out these festive invitations. This set of invitations are flat printed in your choice of typestyles. Blank envelopes are included. Invitation.. 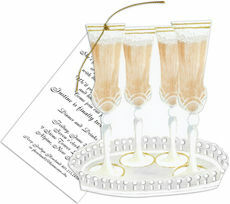 These invitations feature die-cut glittered drinks word on card stock attached to printed invitations secured with satin ribbons. Invitations measure 9" x 3.75". Invitations, envelopes, diecuts and..
Get ready to ring in a new year with the great friends and family in your life. It's a great time of year to plan a party, cocktail celebration, New Year's bash and more. 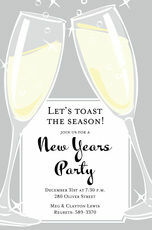 A fun New Year party invitation will add to the excitement and let them know about your event. 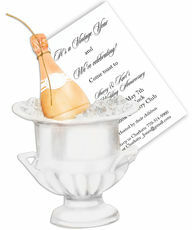 Many of our invitations feature a celebratory theme that is sure to get everyone on your list ready to toast the host. Choose from invitations that feature bold graphic designs with sharp, contrasting colors and gold sparkles to denote luck and wealth for the new year. You could also select from some of the colorful designs that focus on the countdown. Our other featured designs include fireworks, streamers, chevrons and stripes with bright and attractive color combinations. In addition to the traditional rectangular, rounded corners and medallion designs, you'll also find some unique shapes. 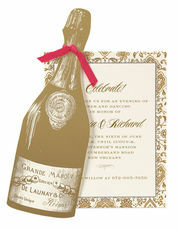 Our die-cut champagne bottle invitations are a fun touch to get the attention of everyone on your mailing list. Once you've selected a front for your invitations, you can choose from many different typefaces. Lavish script styles are a perfect complement to the traditional designs, or you could opt for a whimsical typesetting for a less formal event. We can do the printing in black ink or another color of your choice. We have included plenty of space on each invitation for you to note the important details of your New Year's party. You can include the party's date and time as well as the location of the event. There is also space for your Rsvp contact information, so you'll know how many people to plan for. Have a fabulous New Year this year and celebrate in style! Also consider some fun New Year's Eve party supplies to complement your party including beverage napkins, plastic plates, plastic cups and more!